[semi-recessed] [surface-mounted] wall cabinet with self-trimming flange. receptacle removable from cabinet with keyed tumbler lock. Universal keying. 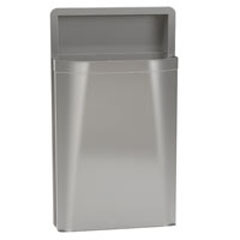 0.036-inch/20-ga. thick, waste receptacle 0.036-inch/20ga. thick. Overall dimensions: 171D8"W x 305D8"H x 8¹¹D�†"D.